On February 20th, I will be discussing Soil Sequestration of Carbon, a hopeful new strategy for combating climate change and promoting healthy soils, in the Arapahoe Conference Room, Second Floor, Main Boulder Public Library, 1001 Arapahoe Avenue. I will cover the whys, hows, research, and challenges of soil sequestration and there will be ample time for questions following. If you are curious about Soil Sequestration of Carbon and want to learn more, I hope you will join me. Climate Change is the overwhelming challenge of our century. We must make rapid progress to decrease CO2 generation and eliminate more carbon from our atmosphere. 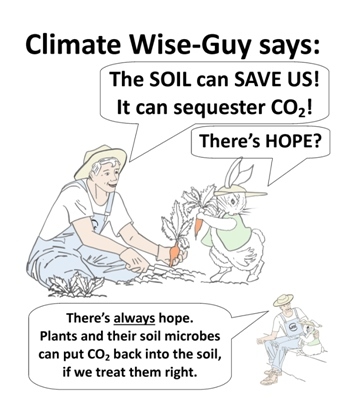 A new and hopeful way to combat climate change is soil sequestration of carbon, which uses specific agricultural, range management and forestry practices to sequester more carbon in the soil than these practices produce. In addition to locking up atmospheric carbon, these practices can also lead to greater soil fertility, better water retention, lower fertilizer/fuel costs, and increased crop yields. Examples of these practices, used in other areas, include reforestation with more resilient drought-tolerant southern species, cover crop cocktails, conservation crop rotation, no-till farming, mob grazing, composted green waste soil applications, biochar applications, and fungal soil inoculations using no-turn composting. Boulder County contains large swaths of agricultural and forest lands which, if managed appropriately, have the potential to annually sequester a large percentage of the CO2 produced by county residents. Soil sequestration of carbon is a new science and Best Management Practices for our local climate and soils are still being developed. Very small capital outlays now to support local studies will pay huge future dividends. Boulder has the opportunity to be a Front Range leader in soil sequestration of carbon, in partnership with CSU, a recognized leader in soils. Pilot Project opportunities to test different practices exist on City of Boulder and Boulder County agricultural lands, as well as private farms which are already using many soil sequestration methods. Currently, most people do not understand the vocabulary or concepts of Soil Sequestration of Carbon. 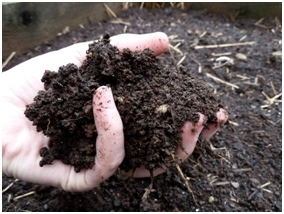 Knowledge about healthy soils is lacking, and most people do not realize that carbon can be sequestered in lawns, mulched flower beds, vegetable gardens, farm fields, rangelands and forest lands. With education, landowners can take simple steps to sequester more carbon themselves. I hope you will consider joining us to learn more, on Saturday February 20th, 1-3PM, in the Arapahoe Conference Room, Second Floor, Main Boulder Public Library, 1001 Arapahoe Avenue. Questions? Call Elizabeth Black at 303-449-7532. Sponsored by Boulder Culinary Gardeners. The Natural Resources Conservation Service of the UDSA has taken the federal lead on carbon sequestration in the agricultural sector. Although they promote their effort as “Soil Health” (http://www.nrcs.usda.gov/wps/portal/nrcs/main/soils/health/ ), they are also promoting the sequestration of carbon as “managing for soil carbon and organic material” (http://www.nrcs.usda.gov/wps/portal/nrcs/detailfull/soils/health/mgnt/?cid=stelprdb1237584). Perhaps they wisely understand that some of their target audience does not “believe” in Climate Change, and so have shifted their vocabulary. The NRCS also has videos and pdfs of individual farmers who are using different carbon sequestration/soil health techniques across the nation. Go to http://www.nrcs.usda.gov/wps/portal/nrcs/detail/co/soils/health/?cid=nrcseprd416103 for pdf’s of Colorado farmers. Go to https://www.youtube.com/watch?v=nWXCLVCJWTU&list=TLsE9MAyLxRnP6v5rPy4Brwu453ENSUDv8 for video interviews of farmers who are using soil sequestration techniques nationally. CSU has just published exciting new study results on a way to maximize carbon sequestration in agricultural soils: http://source.colostate.edu/csu-study-proposes-new-approach-to-retaining-soil-carbon/ for a video short on the study’s findings, and link to the complete results of this study and others. CSU is a leader in soil sciences and carbon sequestration. The Marin Carbon Project is perhaps the best known group in California currently working on rangeland carbon sequestration: http://www.marincarbonproject.org/ Their website has descriptions of various projects they are running with numbers of tons of carbon saved and more. The Quivira Coalition, a Santa Fe based land stewardship organization promotes the “radical center” between ranchers, land managers and environmentalists and endorses carbon ranching, sequestering carbon through regenerative food production and progressive livestock management in New Mexico: http://quiviracoalition.org/Carbon_Ranch/index.html Their website contains links to many past and present projects they are running with local ranchers and livestock. New Mexico State University molecular biologist David C Johnson has several PowerPoints on the web on studies he has done with fungal-rich no-turn compost and carbon sequestration: http://quiviracoalition.org/images/pdfs/3/6253-Johnson_Quivira.pdf . Unfortunately there is no sound and you have to spend some time figuring out his graphs yourself. After defining soil health history/basics/problems, he shows a simple way to make no-turn compost, and presents the results of 3 different experiments plus field trials using no-turn compost. He concludes by comparing costs/risks/benefits of soil sequestration of carbon using Ag practices with industrial techniques (carbon capture and storage or geo-sequestration) and outlines needed legislative fixes to benefit New Mexico.